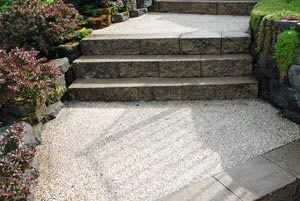 An increasingly popular and time-tested decorative concrete finish is known as "exposed aggregate concrete." 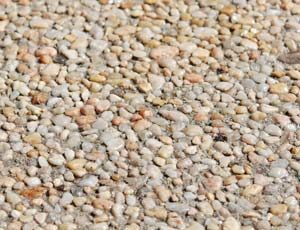 Exposed aggregate is concrete that contains natural stone or manufactured aggregate particles that are exposed from within the surface of the concrete. It is a process that can turn a plain concrete surface into a unique and colorful one, suitable for many of today's most sought after durable indoor or outdoor applications. Exposing the aggregate can be accomplished one of two ways. One way is to wash the concrete surface away from the aggregate. As concrete mix is in the process of setting, a surface-retarding agent is added to the mix. Once the concrete mix has set, the concrete is sprayed with a high pressure washer, and the concrete is blasted away to reveal the aggregate underneath. The second method of exposing aggregate is to mix standard concrete with clean aggregate. 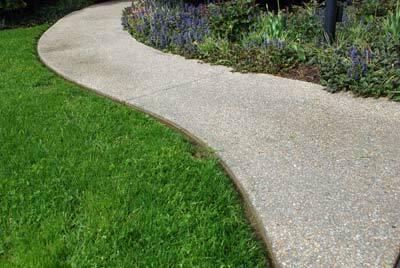 The clean aggregate is “seeded” into the standard concrete surface. The amount of aggregate that is used can vary from heavy to light, and the amount used will determine the texture of the final product. Please contact the concrete experts at Maryland Portable Concrete for the name of a reliable local concrete contractor who can help you create the perfect exposed aggregate concrete surface for your next project.